Notice something about it? It's not easy to tell from the photo, but there's no actual button, just a little red circle with the outline of a hand on it and instructions to touch the red button. 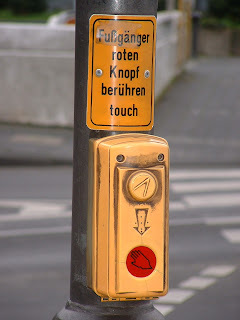 In the United States, there would be a button which you could push to your heart's content and which may or may not have any effect on the actual walk signal. Here, I'd say that a surprising fraction of the time, the lights immediately change upon touching the button. But the action of touching the button is fraught with uncertainty. Did I touch it too hard, not hard enough, not long enough? Who knows? To sum up. United States: ineffective but psychologically satisfying. Germany: effective but psychologically unsatisfying.